Preview of ribbons and distinctions. This plugin enables to present distinctions on a web. Distinctions are classified according to their purpose (supplier). Every distinction contains a description, ribbons, and snapshots of medals. Distinctions can be shown in the form of lists or as ribbon racks. The plugin includes a huge set of standard distinctions of Czech volunteer firefighters, which is growing continuously with every new version of the plugin. [distinctions] - shows the collection of distinctions. [distinctions tabcolor="#841a1a]"...: Shows all categories (groups). Requires the Fruitful Shortcodes plugin to be installed. The tabcolor is optional and denotes the clor of selected tab. [distinctions group="shcms"]........: Distinctions of Sdružení hasičů Čech, Moravy a Slezska. [distinctions group="hzs"]..........: Distinctions of Hasičský záchranný sbor ČR. [distinctions group="chj"]..........: Distinctions of Česká hasičská jednota. [distinctions group="mhj"]..........: Distinctions of Moravská hasičská jednota. [distinctions group="hcr"]..........: Distinctions of Hasiči ČR, o.s. 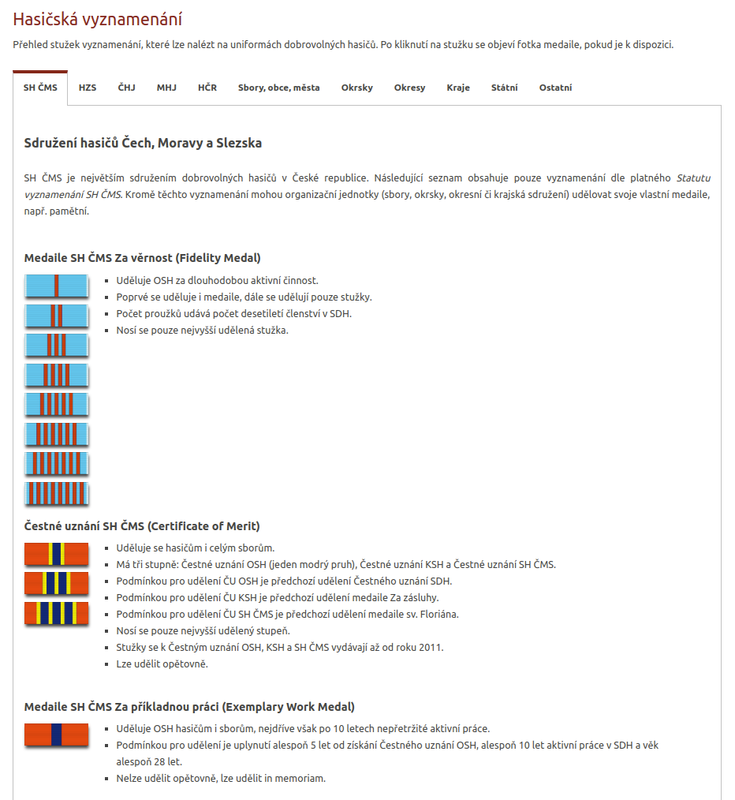 [distinctions group="sbory"]........: Distinctions awarded by particular fire-fighting units. [distinctions group="mesta-a-obce"]. : Municipal level awards. [distinctions group="okresy"].......: Sub-district level awards. [distinctions group="kraje"]........: District level awards. For complete list of available options see conf/distinctions-conf.php. distinctions=""......: Comma separated list of ribbon. Order does not matter. Ribbon names are shown when you hover the mouse over a ribbon. align="center|right". : Align of rows in the rack, either to the right or to the center. Default is center. columns="3|4"........: Number of ribbons in a row. default is 3. Upload distinctions directory to the /wp-content/plugins/ on your web server. Add shortcodes into web pages. Replace /wp-content/plugins/distinctions directory with the new one. If you made some manual changes to configuration files then transfer these changes to the new installation. How to add a new distinction. Please send photo of the distinction (including ribbon) together with a brief description to radek.oslejsek@sdhsuchy.org.